SlideShare is a popular, business-friendly social site – one that you probably already use to enhance the life span of your company’s PowerPoint slide decks and other presentation materials. But could you be overlooking some of the most powerful features and functionalities the platform offers for greater content marketing success? Acquired by LinkedIn in 2012, SlideShare has expanded its capabilities to incorporate additional design options, functionality, and media formats – such as audio, HD video, and more. Content marketers who understand how to take full advantage of these enhancements can tap into a world of possibilities for creating engaging multi-platform experiences and lasting brand value. 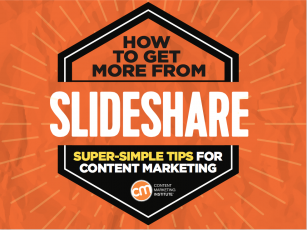 If you are looking to expand your use of SlideShare beyond the basic slide deck, or you just want to get stronger results from any presentation you create, check out CMI’s latest e-book, How to Get More From SlideShare: Super-Simple Tips for Content Marketing. Before you create content on SlideShare, make sure your presentations will be aligned with your overall content marketing strategy. This will help you ensure that each presentation you publish will support your marketing goals and contribute to the business results you want to achieve. Know whom you intend to target with your content, as well as what their relevant needs and interests are. Be able to identify where that audience will likely be in their purchase process as they engage with your content. 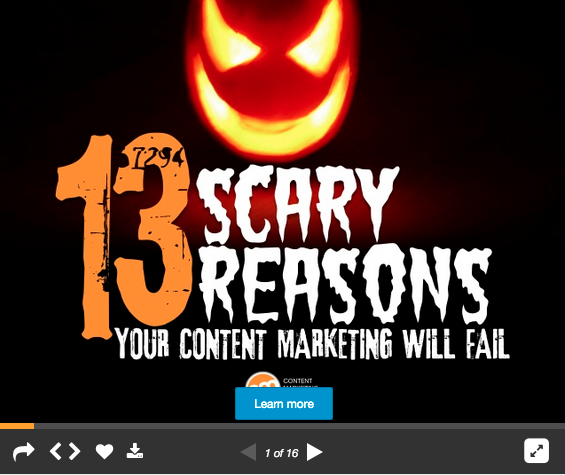 Know what action you want them to take after they read your SlideShare content. 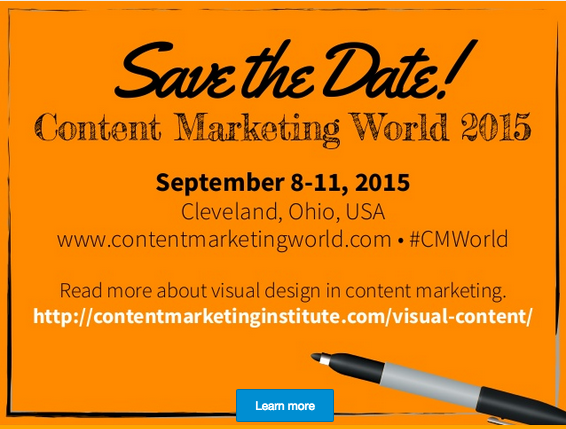 RECOMMENDED FOR YOU: Don’t have a documented content marketing strategy to work off of? 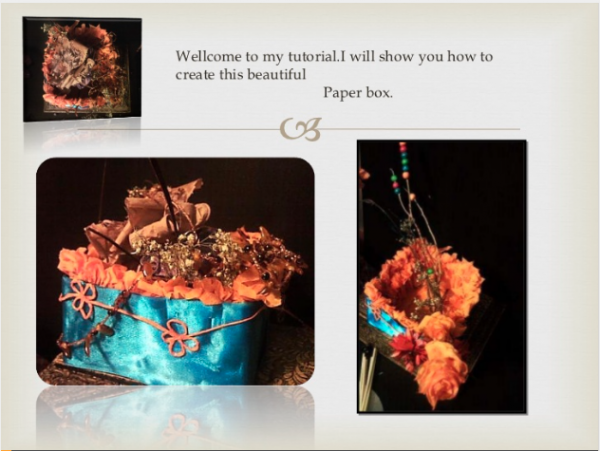 Learn how to create one. Fit the format: Like a PowerPoint slide deck, SlideShare’s default layout is in landscape view, so make sure you size and format your content accordingly. Grab attention right off the bat: The SlideShare home page is a sea of headlines and cover thumbnails. If you want to catch visitors’ eyes as they scan the goods and get them to click on your content, you better have a compelling cover image and powerful headline. Ask, “Would my target audience want to read this?” If you don’t focus on your readers, it will be nearly impossible to grab their attention. Entice, but don’t exaggerate. It’s better to offer useful, honest information with real value than risk angering readers because your presentation doesn’t deliver on the promise of its headline. It’s OK to be a bit of a tease: If you give away all the important information in the headline, people won’t feel the need to read more. Use numbers and lists: Using numbers in your headline gives the audience an idea of how quickly they’ll get the information they want. Check out the competition: Get a sense for how other businesses are positioning their SlideShare offerings, so you can identify potential opportunities to distinguish your content. Ask and you shall receive: Use titles that take the form of a question to pique readers’ curiosity (and ignite their desire to satisfy it). Take advantage of headline optimization tools, like CoSchedule or KingSumo. Present a simple discussion: Often, the best SlideShare presentations are those that create interesting conversations and do so in a way that’s easy for viewers to understand and follow. Keep your story simple and concise so readers don’t lose interest before they reach the last page. 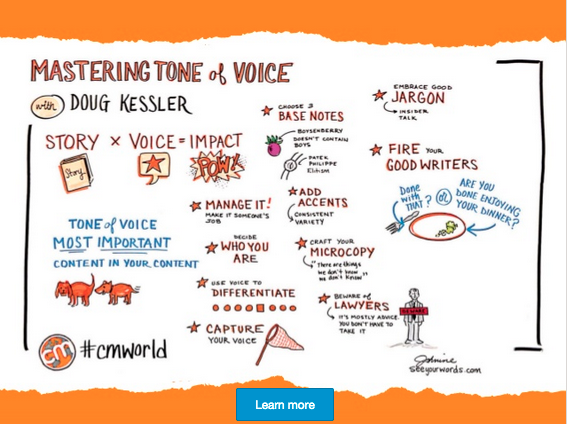 Appeal visually: Memorable presentations often tell a compelling story in a few words. Whenever possible, emphasize imagery over text by incorporating video, infographics, photos, and other static images. Tip: SlideShare has partnered with Haiku Deck to help users create eye-catching visual decks – even if they don’t have a professional designer. You can access this directly in your SlideShare account by connecting to Haiku Deck in your User Settings under Apps. Include a call to action: Insert a clickable link in your slides to make it easy for the user to take the next desired step. For example, we used the final page of one of our recent SlideShare presentations to draw attention to our upcoming Content Marketing World conference. 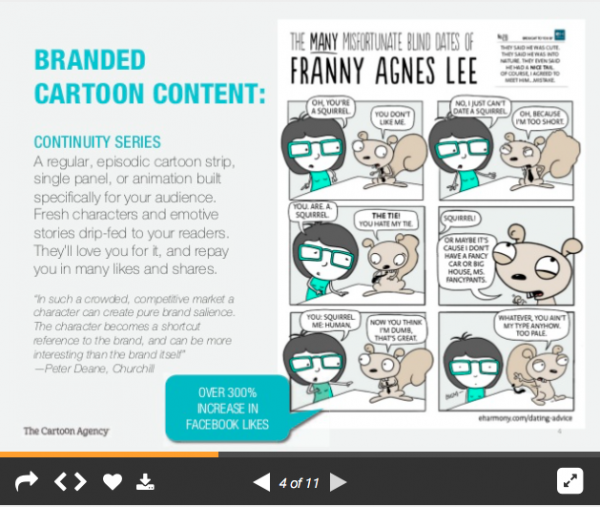 Publish consistently: SlideShare rewards presentations that are recently created and uploaded. The more often you post, the greater your chance of getting featured on the SlideShare home page and on its Top Content lists. Share every presentation: It won’t be enough to just grab people as they pass through the SlideShare home page. You will want to share your presentations as far and wide as possible – including posting them on your social media pages, embedding them in your site content, and linking to them within your other content efforts. And don’t forget to enable others to help you spread the word so that the presentation trends and gains viral visibility. Proof it for perfection: No matter what content you publish on SlideShare, you will want to make sure it shines a positive light on your business. This means it should have error-free copy and a well-designed look; feel consistent with your branding; and have hyperlinks, videos, and lead forms that are working properly. Tip: In his post, 22 To-dos for SlideShare Success, Roger C. Parker shares a handy proofreading checklist you can use to make sure your presentations uphold your company values and quality standards. 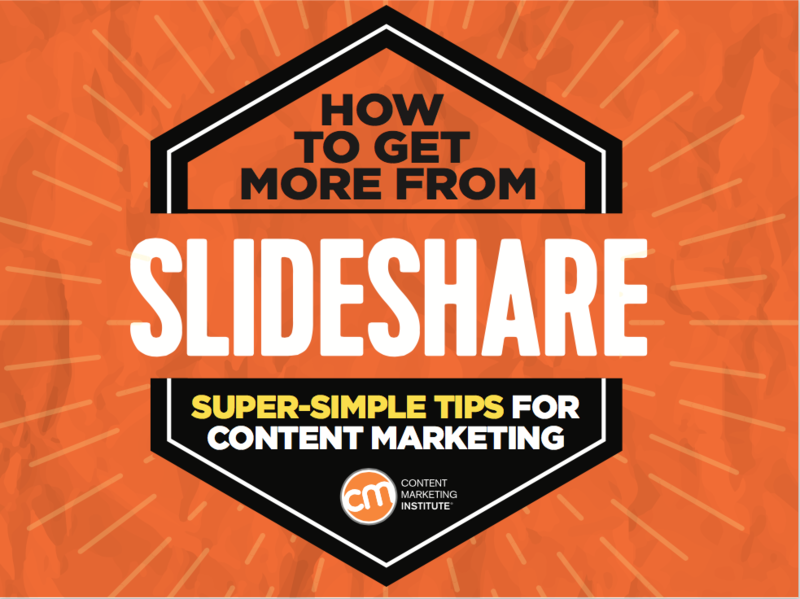 Once you’ve mastered the basics, a wide range of options can help make your SlideShare content more immersive and engaging, and extend the platform’s practical value as a content marketing tool. Insert a YouTube video: SlideShare is no longer a static, text-only medium, it now enables users to insert HD video in presentations. This can be handy when you want to add detail, explanations, or demonstrations to the stories you craft in SlideShare. Incorporate third-party apps: Apps can enhance your use of SlideShare for content marketing – for example, you can synchronize your SlideShare presentations with videos using Zentation, or share your decks in-screen with the participants of your video conferences using Tokbox. And, if you have developer skills, you can even build your own apps using SlideShare’s API. Use it for content repurposing: Extend the value of your existing content – such as Twitter chats, archived webinars, infographics, or your favorite blog posts – by curating them into anthologies or visual scrapbooks of topic-specific information. Use it as an education tool: The SlideShare platform is well-suited for creating step-by-step product demos, team training exercises, or tutorials on specific processes and procedures. And because you can make your SlideShare presentations private, you can control who has access to this content. For more tips, read the complete e-book, How to Get More From SlideShare: Super-Simple Tips for Content Marketing.